read here; but if this doesnt solve your problem, it could be from other things ( for me is working all the time, last night it do 15 sites ) you could delete isk related stuffs. 03/18/2019 09:35:55: Review: MARBEL-1v3 XXXXXXXXXXXXX Sites : 15; Total: 1875884419 ISK # Session: 278293505 ISK ; 494 killedrats . .
03/18/2019 11:50:22: Review: MARBEL-1v3 XXXXXXXXXXXXXXX Sites : 15; Total: 1909254860 ISK # Session: 311663946 ISK ; 536 killedrats . It is solved! Wasnt a problem before reinstall, and in my stupidity i forgot it. 12:48:04.009  : Tactical retreat, reason : Retreat!! Dread on Grid!!. even if there are not reds in system, you have an allarm. this is caused by an bad standings ally ( if flagged even if he is an ally) or even if a red will pop into system in 2 sec. in this case often you will see you warp to home and then the red appear. this is because the red is already in system but …only “in bits” he is traveling between systems. Still, this could work in against you, and you have a red on grid, even if in local he isnt present. Ah! That must be it, it was indeed an anom with supermany rats. Thank you for the awesome explanation and answer. Now I am actually getting somewhere! historically, before aug 2018 there were no more than 8 rats . Since then, on same anomaly, from time to time, it appears 20 really agressives; you take a lot of damage even before you start orbiting. I lost like 10 ships because of that because I didnt see at time ( they dissapear after 1-2 h) .For that I had to watch my bot days and develop diverses strategies ( saving logs, take ewar on sip etc), i had to ewar with an second char to see and take the good measurements from sanderling etc. but anyway, i think now you are used with this script, you can start with marvel one. Tactical retreat, reason : Retreat!! Dread on Grid!!. 14-32-58 1946 # Old Site value : False . I have tried to do a specific warp for each type of allarm, but after 5-7 sites he die effectively. For example I have an old computer, and his latence is much bigger than my laptop. and at each 5-6 h he start to … calc, check files etc from windows , even if I stoped him almost all stuffs. in this times, is really hard for bot, all measurement are coming harder, any click is not on time, or evenhe jump over some of them. Im doing some error-checking and getting that the scan gives an anom that is null, which it shouldnt? It should delete it (ignore result)? In log it says anom is null. So why doesnt probescannerwindow give a proper result that it can ignore? 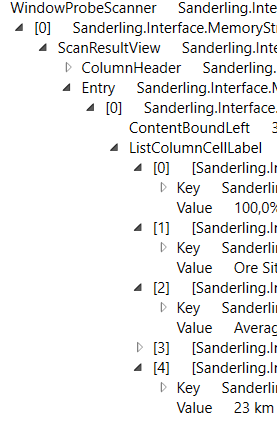 if scanActually anomaly is null but you have a reading ( in sanderling) with “km” then the reading is with errors ( it come if you start-stop the bot multiple times, or if you change the chars etc) and sanderling doesnt take action on uielement; is better to reastart the computer when face things like that. also sometimes, probe window could ( sometimes, it hapens if you read on forum) is " considered" like a stack window. in this case you have to reset interface, close sanderling from processes , make at first a big ( almost entire screen) window probe, and try multiples times, until the window is well recognized. Will try restart and make probe window bigger. Might help!